Director of the Institute of Management : Mr. Marián Zajko, Assoc. Prof. MSc., PhD., M.B.A.
Institute of Management of the STU is the pedagogic, research and scientific unit of the Slovak University of Technology. It is providing research and pedagogic activities in the area of management and urban planning, closely cooperating with other university units, domestic and foreign universities and other scientific and academic institutions. It guarantees the study programs and specific study courses and education modules that are related to its profile and it takes care of integration of STU capacities in management and planning study programs, interdisciplinary study programs that have the university character. To integrate the capacities of Slovak University of Technology into the areas of management and planning and to guarantee the knowledge development in the mentioned areas at the Slovak University of Technology. Department of Economics and Building Management - Head of the Department: Ms. Mária Zúbková, Assoc. Prof. MSc., PhD. 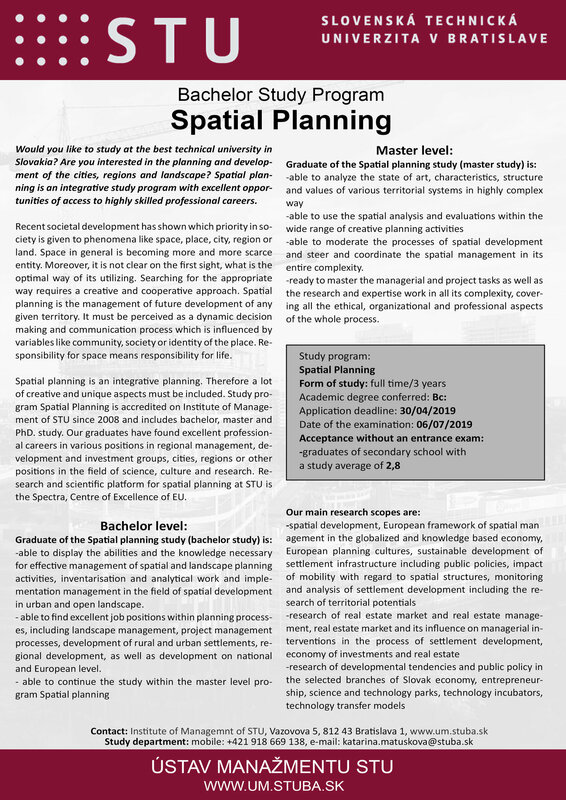 Department of Spatial Planning and Management - Head of the Department: Ms. Dagmar Petrikova, Assoc. Prof. MSc., PhD. Department of Economics and Management of Enterprising - Head of the Department: Mr. Marián Zajko, Assoc. Prof. MSc., PhD., M.B.A.
Department of Management of Chemical and Food Technologies - Head of the Department: Ms. Monika Zatrochová, Assoc. Prof. MSc., PhD. Department of Real Estate Engineering - Head of the Department: Ms. Daniela Špirková, Assoc. Prof. MSc., PhD.